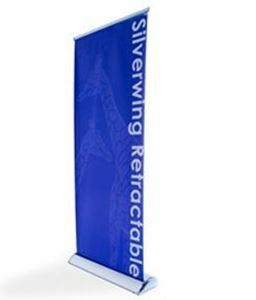 It is quick and simple to use and holds 33.5"w x 69" to 92"hbanners (with a 6" bottom bleed) attached by clamp bar. The Silverwing is finished in anodized silver and chrome plastic end caps. It easily portable in its foam-padded carry bag (included). Graphics turnaround 3-5 business days after proofs are approved. Please call for production schedule if you need it sooner.